At 14:40 on the 28th July 2014, I received a call from Irene Rule of Blue Horizon Bay telling me that I was about to go to sea! 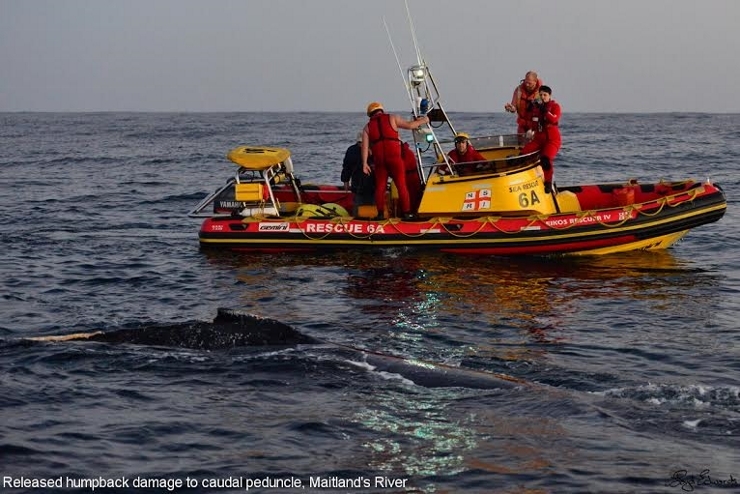 One of the residents of Maitland's Hill, Andre, had reported an entangled whale about 1km offshore from the river mouth. Armed with my binoculars I raced to the scene. Sure enough there it bobbed, ensnared in a length of 20mm nylon rope with two yellow buoys in tow. I first called the Bayworld head of marine mammals Greg Hofmeyr and discussed a plan of action. I then called NSRI station chief Ian Gray in order to mount a rescue plan. Time was not on our side and the race was on to see if we could get to the distressed animal before nightfall. It was now 15:00. While Ian scrambled his team I raced home, grabbed my camera, picked up my trusty crew Jan Volschenk and sped to the BP 6th Ave Auto Centre to fill up with 200 litres of fuel. Well done to Trevor Hayes and BPSA for sponsoring the fuel for our operation! We arrived at the port at 16:00, picked up Greg and left moorings at 16:10. The NSRI vessel already had a good start on us and was much faster. There was about a two and a half metre swell running but luckily no wind, so we made good progress. 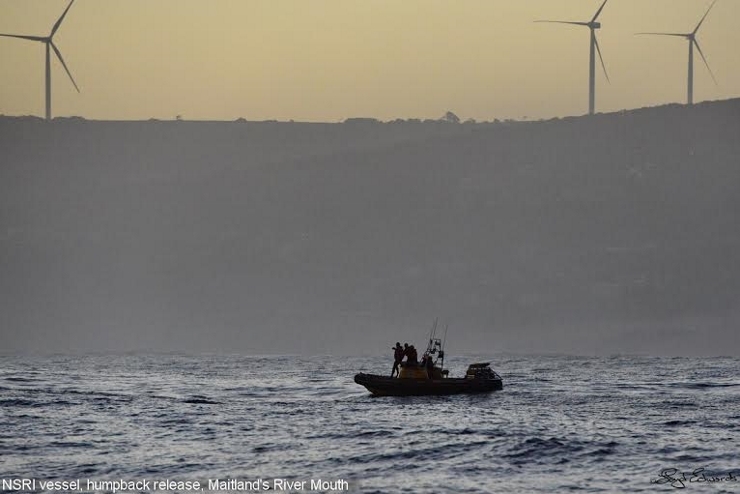 The NSRI vessel arrived at the scene first and made an analysis of the situation. The thick rope was wrapped five times around the caudal peduncle (the stock above the tail flukes), once around the flukes and once through the mouth. It had fought so fiercely that it had pulled the ropes so tight that the body was bent in a U shape. It must have really been in immense pain. Although protocol dictates that the operation should be carried out by two boats, due to the rapidly deteriorating light it was decided to commence with cutting the ropes immediately. This was done after consultation with the head of the SAWDN Mike Meyer, who has carried out many a successful release. The nylon cables were no match for the finely honed blades of the specially designed knives. Every time Daniel Hyman tried to cut through one of the tail wraps however, the whale would kick, and because its body was in a U shape it would do a 180 degree turn. Eventually after 40 minutes of persevering, the last rope was cut. He did not have to do the tricky cut near the mouth (and therefore also near the eye), it merely pulled itself free. I took some photos of the released creature as it was just moving slowly around the two boats in the twilight. It was just bobbing around and breathing weakly. We wondered how long it had been in this U shaped position, as it would now take quite a while to get its muscles moving again. 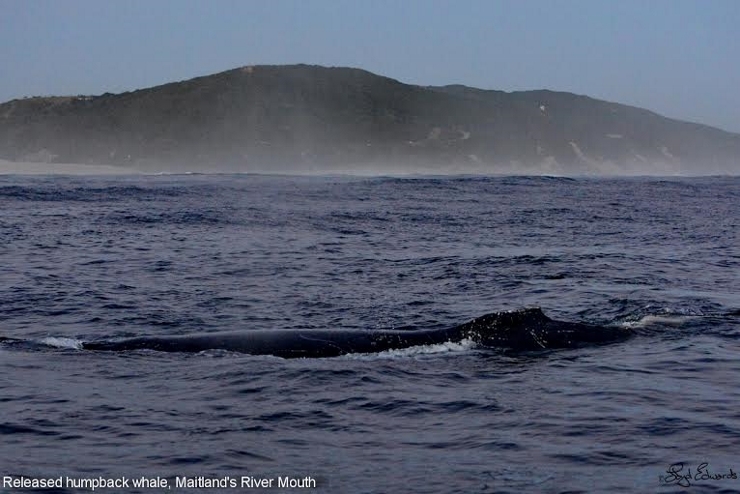 It was only the next day that Ian compared photos taken from a SAAF helicopter during a search for a man overboard on the 22nd July that we realised it was the same whale. The yellow buoys sighted on a whale 30 miles south west of Cape St Francis were distinctive. Due to the height of the chopper and the fact they did not have enough fuel to investigate the entanglement fully, it led them to believe that it could possibly have been a killer whale. This can happen, as I often get people calling me to say there are killer whales in the bay, when in fact they are humpback whales. It is the white on the underside of the tail flukes and flippers that leads people to this conclusion. So at the very least this animal must have been tethered in this U shaped position for seven days. It must have been the return Agulhas current (inshore counter current) that brought the animal in an easterly direction to Maitland's River Mouth. It is amazing to see how incredibly determined these animals are to survive, no matter what mankind throws at them! As can be seen in the attached photos, there is heavy scarring on the caudal peduncle. 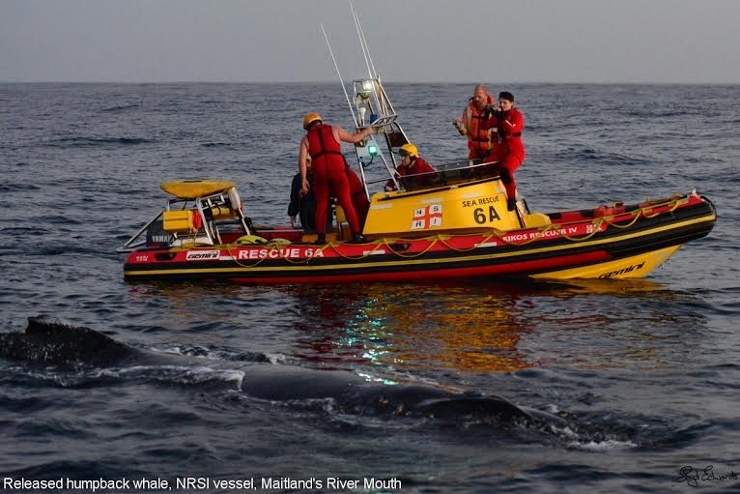 Other photos show the Blue Horizon Bay wind turbines in the background, left and right images of the dorsal fins (used to identify different individuals) and some photos of the NSRI crew. 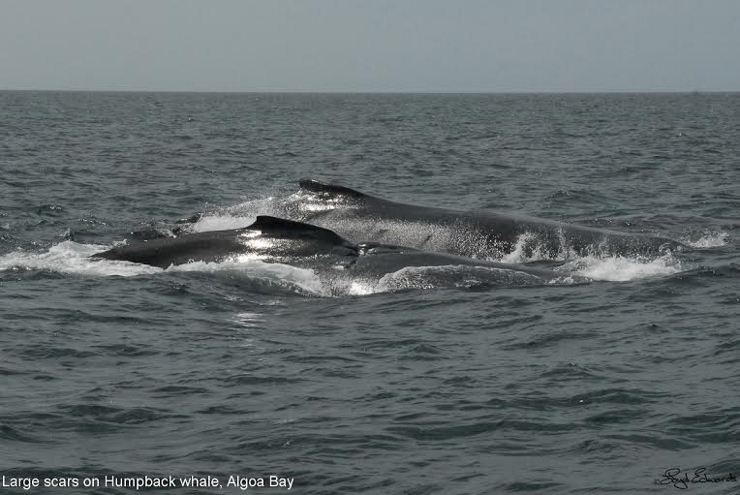 I have seen worse scars than this as can be seen in photo # 6 of a humpback that I took in Algoa Bay a few years back. It is unknown how this damage occurred (could have been a ship strike) but it healed perfectly and even re-pigmented the skin. Hopefully we will observe our released and healed fellow one day again. 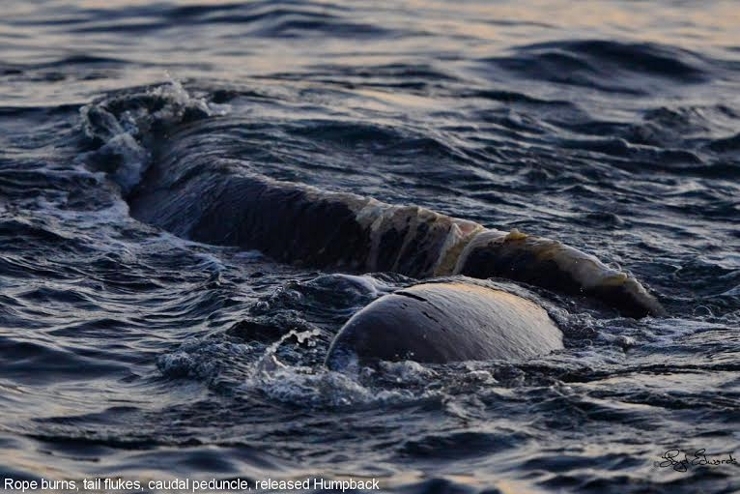 We watched the whale for a little longer and admired its courage as well as that of its saviours. As night was now upon us, we hit the path home. Racing through the dark ocean at 22 knots is quite an exhilarating experience. The whole operation could not have been successful without the cooperation of the coastal community, so please, keep a sharp lookout and when you see an entangled animal or stranding give one of the members of SAWDN a call or contact Raggy Charters on 0731522277. I have been in contact with all my "whale spies" this morning and as of 11:00 there have been no sightings or strandings so we all hope for the best! Please note that this is not the official SAWDN report but supplementary information, some of which will be used to compile the report.